In 1965, 20th Century Fox released the film John Goldfarb, Please Come Home. A comic spoof on the Cold War, the film depicts the mad-capped events after a spy plane flown by John Goldfarb, a former Notre Dame football player, crashes in the fictitious Arab country of Fawzia. The King (Peter Ustinov) keeps Goldfarb (Richard Crenna) prisoner, forcing him to teach a group of Fawzians how to play American football. Jenny Ericson (Shirley McLain) is a reporter who goes undercover as a member of the king’s harem. Ambitious to make Fawzia known around the world, the king blackmails the U.S. State Department into arranging a game between his team and the icon of American college football – the Fighting Irish of Notre Dame. Jenny and the harem become the Fawz U. cheerleaders for the big game. Some people say that the film is one of the most embarrassing moments in the history of Notre Dame football – at least until this season. This was a tough year for Notre Dame football fans. 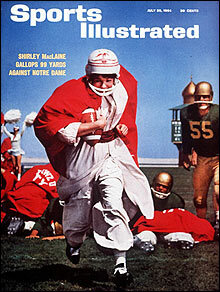 The young Irish team struggled most of the year, losing many games by lopsided scores. For me, the low point of the season was the loss to Navy, snapping a 43-game winning streak by the Irish over the Midshipmen. The words hung in the air as I gave more thought to Weis’s care about the players. Earlier that week, the older brother of one of the freshman players had been shot dead in Chicago. Coach Weis spent hours consoling the family. On Friday, the day before the Navy game, more than 50 players and coaches traveled to Chicago for the funeral. They went to pay their respects and support their teammate, a member of their Notre Dame family. Years later they may not remember the tough games, but they’ll remember the valuable life lessons taught by Coach Weis. I learned the lessons of family and Notre Dame at a very early age. Dad and I would drive from Illinois to campus to watch the games during the “Era of Ara,” the great years under coach Ara Parseghian. While Dad never attended Notre Dame, he was a devoted fan of the football team. Later, a month before I entered the university as a freshman, we visited my grandparents in Indianapolis. Grandma was baking Snickerdoodle cookies in the kitchen and Granddad was sitting in his favorite chair, writing in a black scrapbook. He then called me over and gave me the scrapbook. It was filled with newspaper clippings about the life of Knute Rockne, his amazing career at Notre Dame and his death from a 1931 plane crash. While Granddad never attended Notre Dame, his devotion to the Blessed Virgin Mother created a strong tie with the university. The scrapbook included a ticket stub to the 1935 football game between Northwestern and Notre Dame. I figured that Granddad was a fan and had gone to the game in his youth. I stuck the ticket stub in the scrapbook and forgot about it. Eight years later in 1983, Granddad passed away. Just this past September, twenty-four years after her husband preceded her in death, Grandma passed away at the spry old age of 92. They are now reunited in heaven after so many years. A call to Mom brought to light more details about these two tickets, now reunited after so many years. Since my grandparents married in June 1936, they must have traveled together to the game during their courtship. They probably stayed with Granddad’s sister, who married a Notre Dame graduate in the Log Chapel. I had no idea there was another family connection to Notre Dame. The Irish lost that game in 1935, but our family has thrived. Now there’s an even stronger family connection to Notre Dame. I graduated in 1980, my sister Cathy and husband Joe graduated in 1981, brother Andy graduated in 1988, nephew Rory is a current freshman and aunt Peg is working on her Master’s from the university. The future looks bright for our team, as they won their last two games of the year. We just need to continue to support the coach and the team. The rain will stop one day; the sun will glisten again on the Golden Dome. Stay strong and keep the family united. We are ND. Originally published in the November 30, 2007 issue of The Tennessee Register. In love and work, you often have to make a choice. For best-selling author Nicholas Sparks, the choice was easy – create characters in his novels with many of his own faith-driven values. In Sparks’s novel The Notebook (also a film from New Line Cinema), Allie has to choose which man to marry. Does she play it safe and follow through with her engagement to Lon, a wealthy, powerful lawyer? Or does she follow her heart and go back to Noah, with whom she shared a romantic summer? These choices, says Sparks, are what life is all about. Sparks has made many choices since he graduated with honors from Notre Dame in 1988. A business finance major who ran cross country and track (he helped set an Irish school record in the 4 x 800 relay), Sparks held a number of jobs before renewing his interest in writing novels. After selling The Notebook to Warner Books and feeling good about his work on Message in a Bottle, he chose writing as his fulltime profession. But he still makes choices about his writing, especially what he won’t include in his novels. The characters in his novels are usually Christians with strong faiths that play important roles in their lives. Sometimes that faith is front and center, such as in Jamie, the daughter of a Baptist minister in A Walk to Remember. In other works, the faith is reflected in the character’s values toward family, community and doing the right thing. In The Notebook, Allie’s faith is reflected in trusting herself to make the right choice, despite the hurt it will cause another. She ultimately makes up her own mind, drawing upon her values to guide her decision. This instinct, a strong belief on one’s own values, is similar to what Sparks uses to make decisions about his novels and his life. “I rely a lot on intuition, but my intuition is based very strongly on faith and morality. This all comes from being raised in a very value-driven household. I was born and raised Catholic, my wife is Catholic and our kids go to parochial school. I think about the values I’d like to instill in my kids, how I want my wife to view me as a person, how I want friends and other family to view me as a person. I’m very well read in the Bible, having read it about seven times from cover to cover. For example, Noah writes a love letter to Allie every day after their summer together. Similarly, Sparks wrote his future wife “about 150 letters” during the two months after meeting her during Spring Break. “You have to draw your characters from somewhere. You draw them from yourself, from people you know,” says Sparks. Based upon his success with eight best-selling novels and some very popular movies, Sparks has made a number of good choices with his writing. Millions of readers would agree. Originally published in the July 18, 2004 issue of Our Sunday Visitor. Singing in church choirs has given me many opportunities to travel and meet people of different races, colors and creeds. As a member of the Notre Dame Glee Club, we once traveled by planes, trains, buses and boats to perform concerts in Western Europe. There’s nothing like traveling overseas to give you a new perspective of our own country. But the true value was meeting people with entirely different life experiences. Sometimes we stayed in peoples’ homes, other times we met the locals after the concerts. We listened to their stories, enjoyed their customs and saw the world from a different point of view. Their buildings were old, some still scarred by war. Their family histories were deep, some still scarred by oppression and conflict. Many do not enjoy the personal freedoms we take for granted. I could see the differences with my own eyes. A memorable stop during this trip was at Dachau, the Nazi’s first concentration camp in Germany. Built to hold 5,000 individuals, Dachau’s barracks during the Holocaust once held more than 30,000 Jewish people. Many did not stay very long. In an old photograph, my college roommate Jeff Rubenstein stands in front of a large plaque written in Hebrew. He said later that visiting Dachau, where so many Jewish people who shared his faith were indiscriminately murdered, made him both sad and angry. I learned about different faiths because I was there. But for the students of Whitwell Middle School, an extraordinary program teaches them the lessons of tolerance and diversity, even if most of them never leave the hills of rural southeastern Tennessee. Paper Clips is an award-winning documentary that describes how a school program reached around the world to touch countless communities, people of different faiths and even survivors of the Holocaust. Principal Linda Hooper said they had a distinct need to teach their students about tolerance and diversity. “Our entire town is only 1,600 people. There are no Jewish people, no Catholics. The school has only five black students and one Hispanic student. (In 1998) we didn’t have a clue what different people were like,” she states. Assistant principal David Smith and 8th grade teacher Sandra Roberts had a goal: “to teach the students what happens when intolerance reigns and prejudice goes unchecked.” They decided to teach the students about the Holocaust. During their classroom discussions about the six million Jews killed by the Nazis, one of the students asked “what does six million look like?” They decided to collect six million of some object to better comprehend the number. After searching for an object small enough to collect, they settled on a paper clip, which was used by Norwegians during World War II as a symbol of unity against Nazi Germany. So began the campaign to collect six million paperclips, one for each of the victims. But instead of placing a large order at Wal-Mart, the students wrote letters. They sent letters about their program and asked for a paper clip from famous individuals. They received letters and paper clips from Presidents George Bush, Bill Clinton and George W. Bush, and entertainers like Tom Hanks, Bill Cosby and Tom Bosley. The next year, national journalists discovered the program and wrote articles for The Washington Post and the NBC Nightly News. Within the next six weeks, the school was inundated with millions of paper clips. Most shipments included letters from Holocaust survivors, their family members, even the soldiers who liberated the camps at the end of the war. The authors praised the students for learning the valuable lessons of respect and tolerance. They were pleased to send a paper clip so that the memories of their loved ones could finally rest in peace at Whitwell. The program indeed changed the lives of many students and teachers. The “Children’s Holocaust Memorial and Paper Clips Project” is open to the public. It is located behind Whitwell Middle School in an authentic German railway car used to transport the victims to the camps. The lessons of tolerance and diversity are just as important today as any day. We should support efforts to stop the genocide in Darfur. We should celebrate our country’s diversity, not segregate people into separate camps. Our leaders will do well to remember this lesson. If not, they should visit Whitwell Middle School and learn a few things. Whether you believe by faith or learn by sight, the path to enlightenment is worth the journey. Our society needs tolerance and respect. The price of ignorance, intolerance and racism is way too high. First published in the August 10, 2007 issue of The Tennessee Register.